Made entirely of aluminum, the Roadside Mailbox features both a front and rear access locking door. Available in a black, white, green or silver powder coated finish, each unit includes an outgoing mail tray, a lock with two (2) keys on each door (keyed alike) and an adjustable red signal flag. Mail is deposited through a non-locking access panel on the front. Made entirely of aluminum, Roadside Pedestal mailbox posts are available in bolt mounted and in-ground mounted styles. These mailbox posts feature a durable powder coated finish available in four (4) contemporary colors. Made entirely of aluminum, these posts are in-ground mounted only. This Designer Roadside Deluxe Mailbox Post can accommodate two (2) Designer Roadside mailboxes. 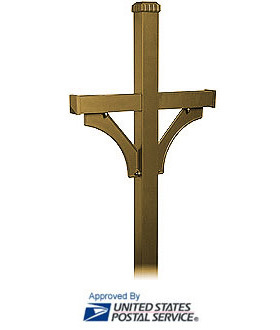 Single Designer Roadside Mailboxes can be mounted on our designer deluxe 1-sided posts. 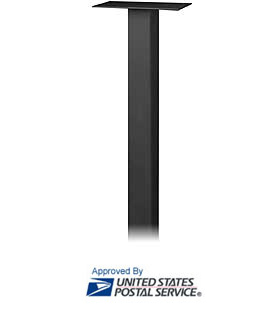 Deluxe mailbox posts feature a durable powder coated finish available in eight (4) contemporary colors. Minor assembly of decorative mailbox posts is required.